Watch Waterbird Data Being Entered Live! Waterbird counter Adam Bradley enters data live throughout the count each day. Now you can watch as the data is being entered! 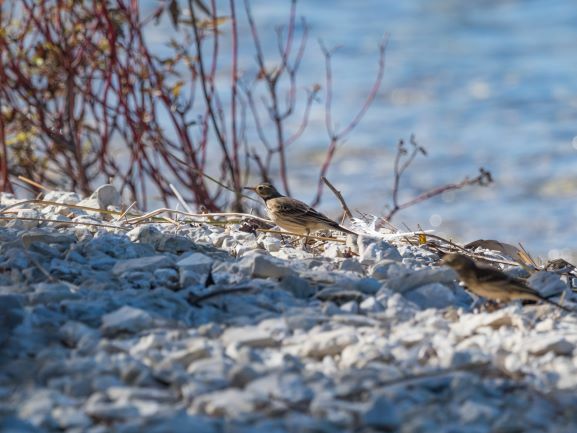 Go to the Live Waterbird Updates page, or click on the menu item of the same name, during the count period each day to watch as new data is being entered! This entry was posted in Uncategorized on April 5, 2018 by Darrell Lawson. Sorry for the out-of-sequence post, but after filling in for Aspen on Saturday I decided to stick around and visit the owl banders. Having not made it home until after midnight, I decided to wait to post until I could write it while actually awake. The waterbird count on Saturday featured lots of birds, but nothing in comparison to Aspen’s Harlequin Duck from today! My day mostly consisted of Long-tailed Ducks, Redheads, and White-winged Scoters. 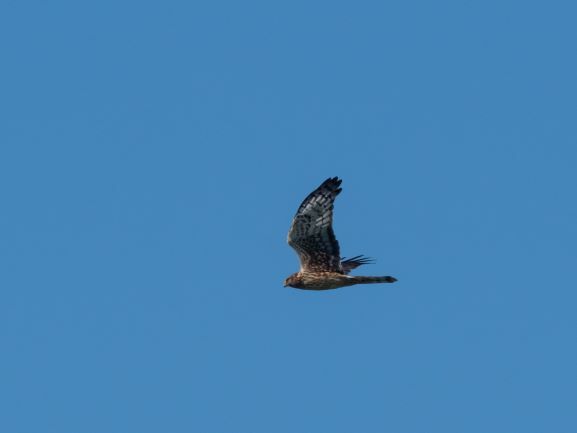 The surprise though was the number of Northern Harriers that came south. It was a big day for them with 11 spotted during the count. 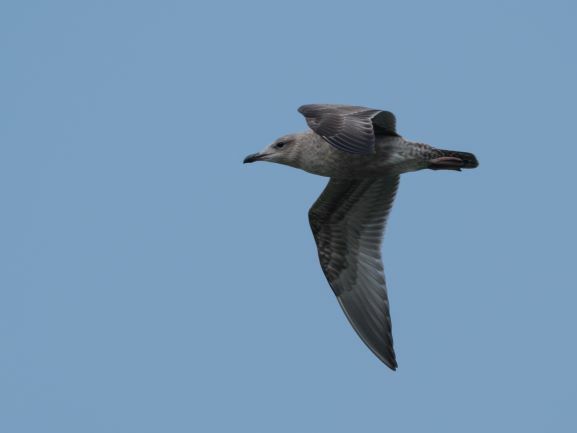 The real excitement was that both a Great Black-backed Gull and a Lesser Black-backed Gull were seen flying south during the count. This is the first time I have spotted both species in the same day. Here is a list of all birds counted for the day. This entry was posted in Uncategorized on October 30, 2017 by Darrell Lawson. Today was an exciting day at the count. I once again filled in for Aspen so she could have a day off. That’s not really the exciting part (unless, of course, you happen to be Aspen). The pace was fast and furious when I first arrived. The west winds had birds swirling around all over. 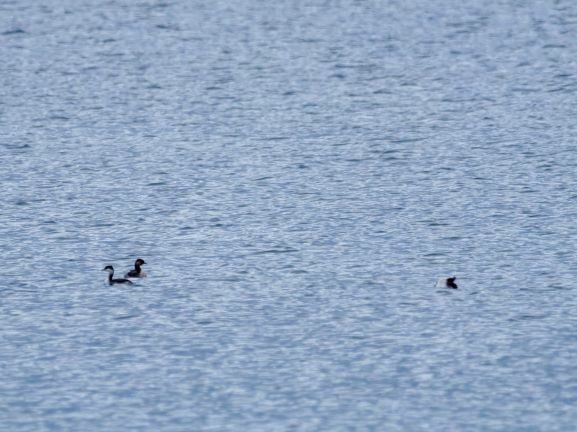 Most were various species of aythya, mostly Redheads with some Greater Scaup thrown in. The first exciting bird of the day was a Canvasback that was in with a flock of Redheads. This was exciting because it is the first time one has been recorded during any of the counts going back to when we began them. In fact, it may be the first time one has been recorded at this site ever. 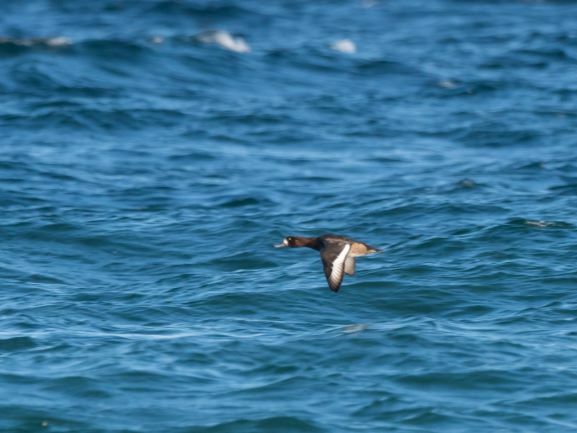 I didn’t get photos of this bird though, but here is one of a Greater Scaup that flew by close to shore. 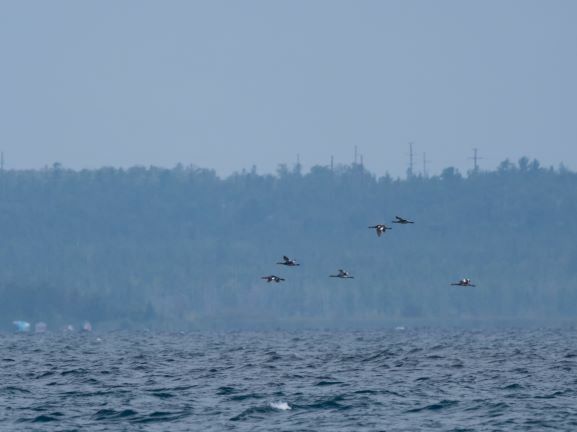 Loons were also on the move this morning. Good numbers of both Common and Red-throated were present, although their activity diminished very quickly during the late part of the second hour. 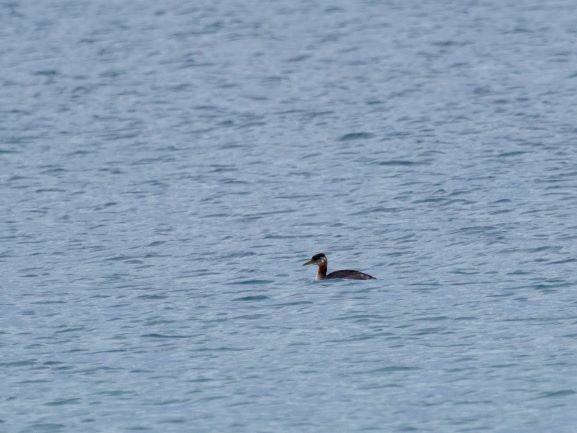 This is the first day this fall that I counted more Horned Grebes and Red-necked although both were present. 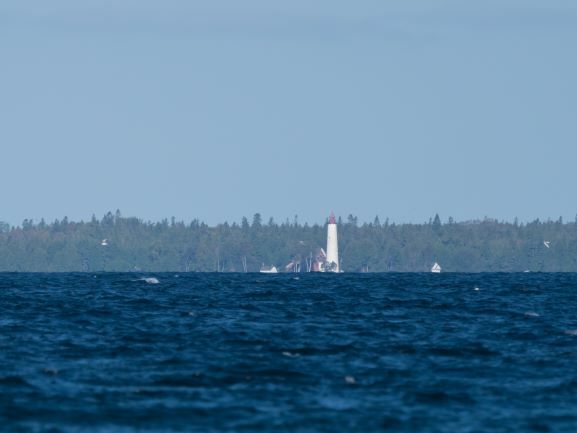 Here is a photo of one of the former that was hanging out just off shore. 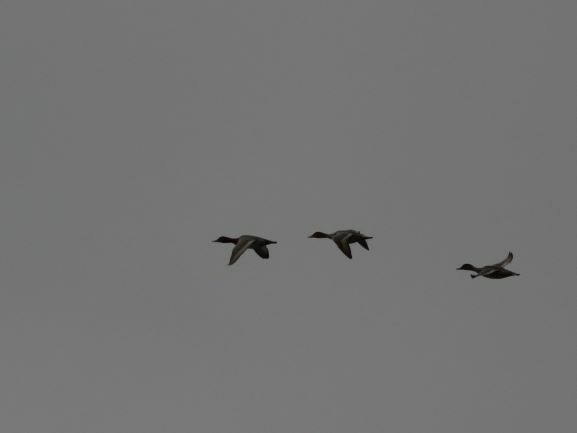 There were also a few dabblers in the air today. 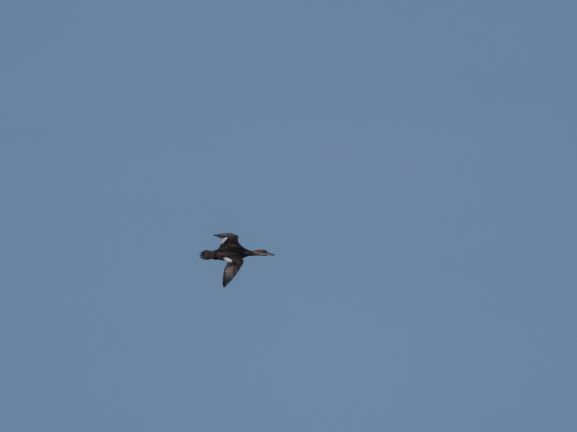 Here is a distant American Black Duck that was flying west early in the morning. 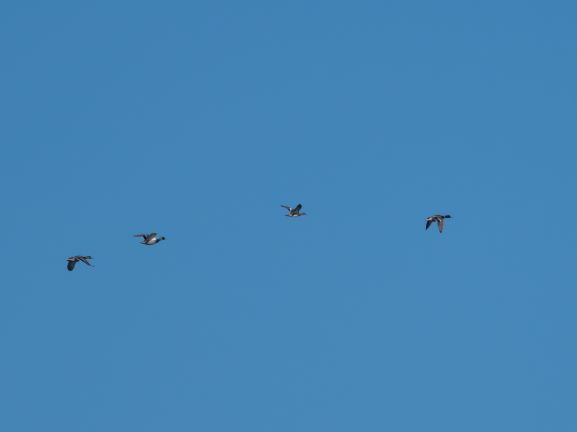 And here is a mixed flock with three Mallards and an American Wigeon. 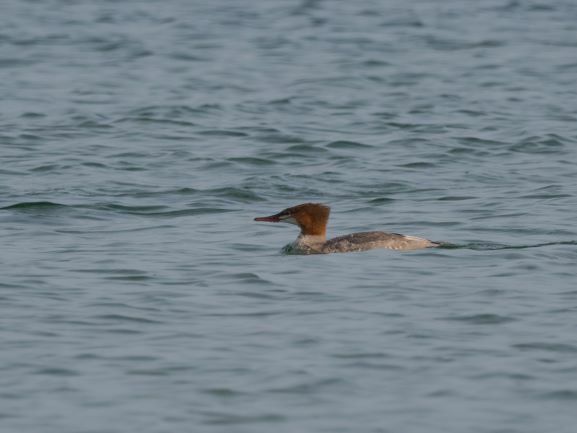 And of course, there were still a few Common Mergansers flying back and forth just off shore throughout the day. 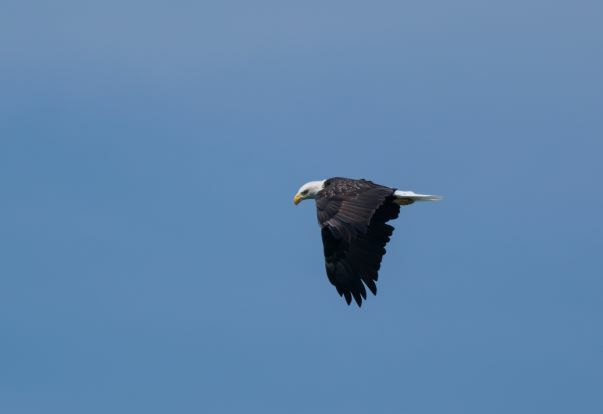 As the day warmed up, Bald Eagles began to make regular forays into the lake, often returning with food. 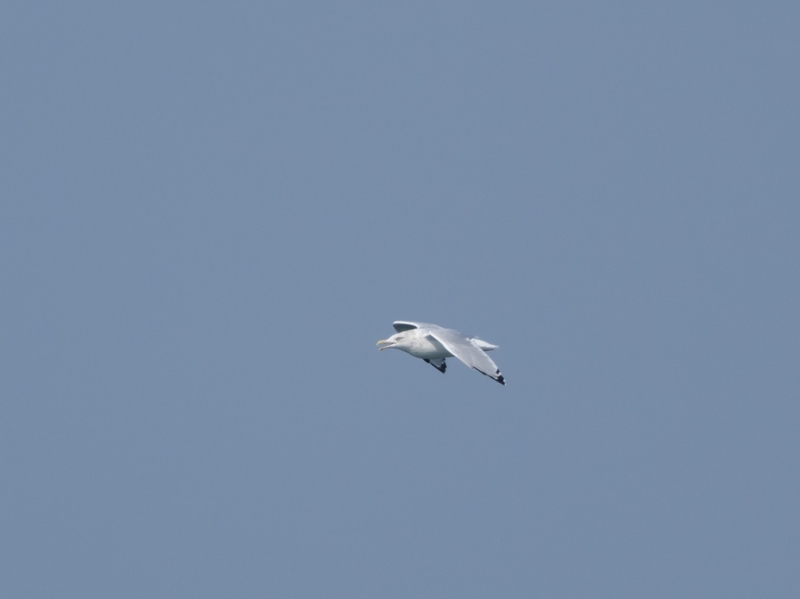 Here are a couple of photos of one that flew directly overhead. 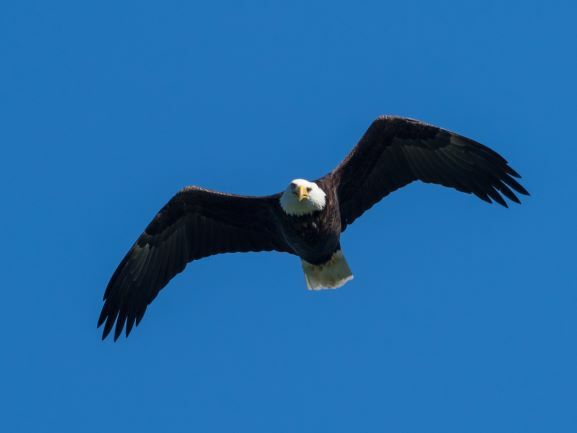 Bald Eagle – always fun when they watch you take their photo! 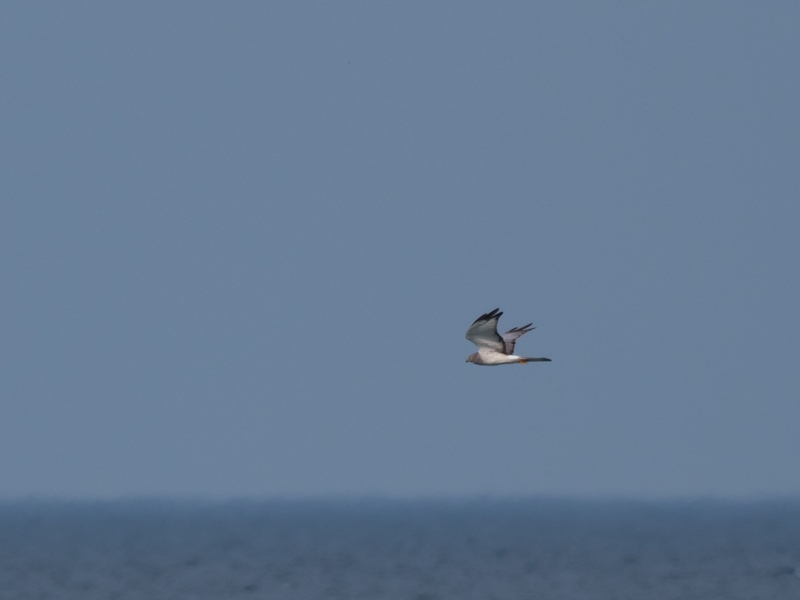 There were quite a few Northern Harriers flying south today also. 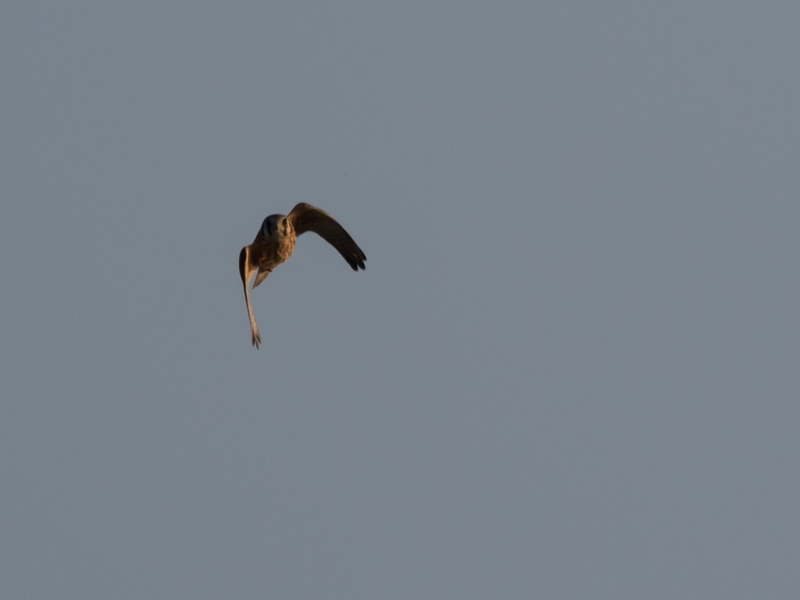 However, the most exciting bird of the day was a shorebird. We don’t get many shorebirds at the McGulpin Point count, so when they do show up they are always a treat. In this case, the one that showed up was extra special since it is an uncommon bird in Michigan in general. 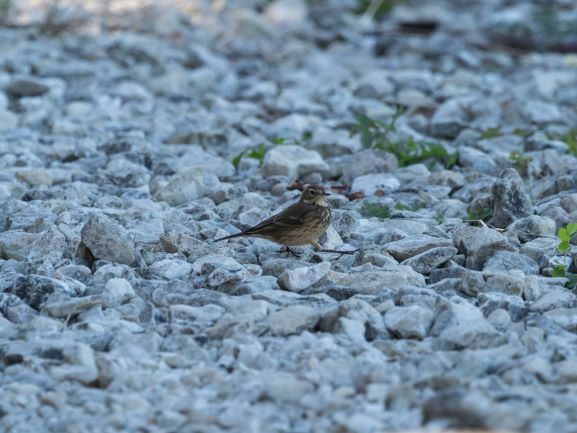 This may be not just a new bird for the count and the McGulpin Point site, but also for the entire county. 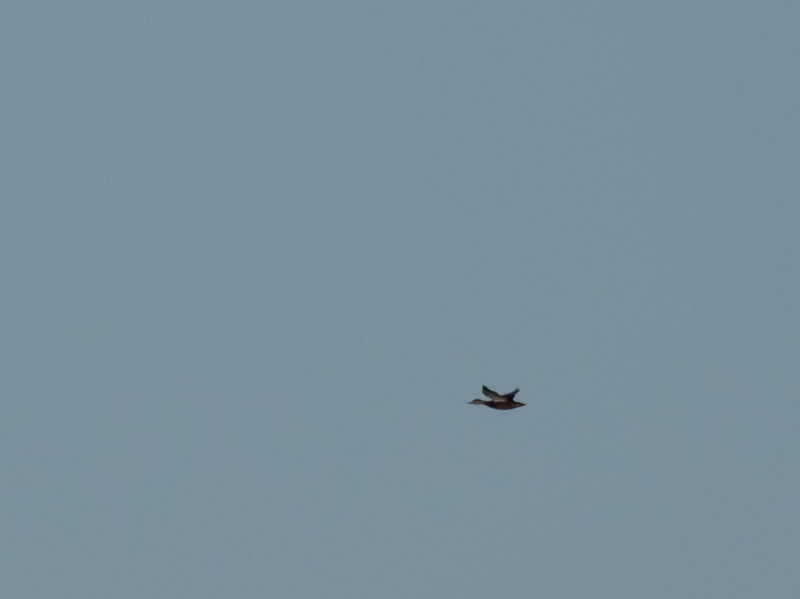 Although the photo is pretty awful, here is the American Avocet. 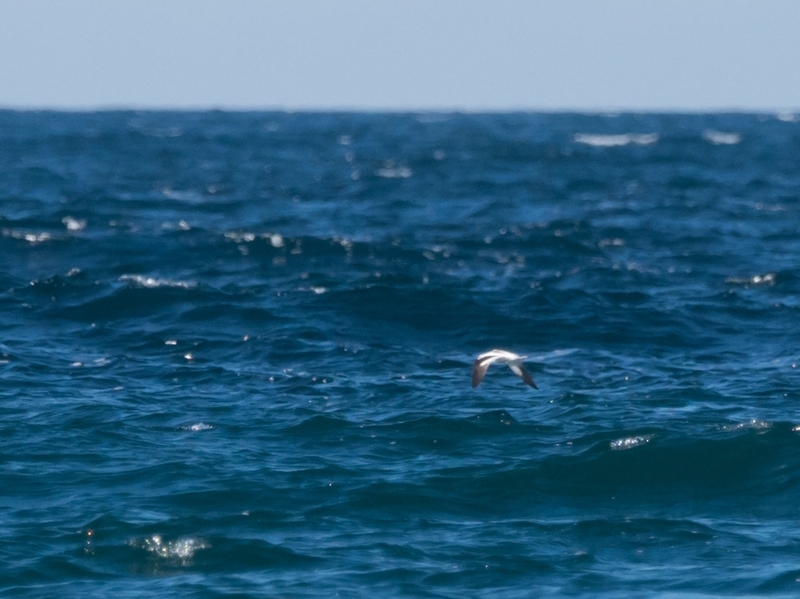 Speaking of horrible photos, here is a terrible photo of Bonaparte’s Gulls flying by Saint Helena Island. If you’re as nerdy as me, you might get a chuckle out of it. And I’ll leave you with one last photo before the final bird list for the day. 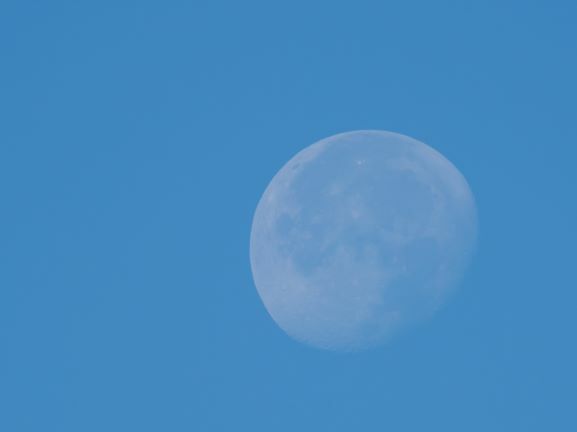 The moon was kind enough to keep me company this morning so I took a photo of it. Besides, the moon is just cool. This entry was posted in Uncategorized on October 9, 2017 by Darrell Lawson. I filled in for Aspen again today. The morning was more productive than I have seen yet this fall. Most of the early morning consisted of counting Redheads and White-winged Scoters. Here are a few of the former. 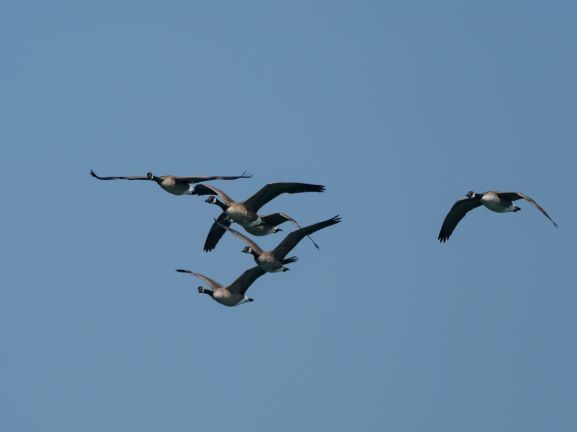 The highlight of the morning came when a group of Canada Geese came over with a blue-morph Snow Goose. Although the picture is not great, here it is. The loon numbers were very low today, with only two Common Loons and three Red-throated Loons. After the first two and a half hours had a decent amount of activity, the waterbird movement just sort of died. The next two hours were pretty slow until the raptors started moving. Red-tailed Hawks, Turkey Vultures and Sharp-shinned Hawks all came south in good numbers. 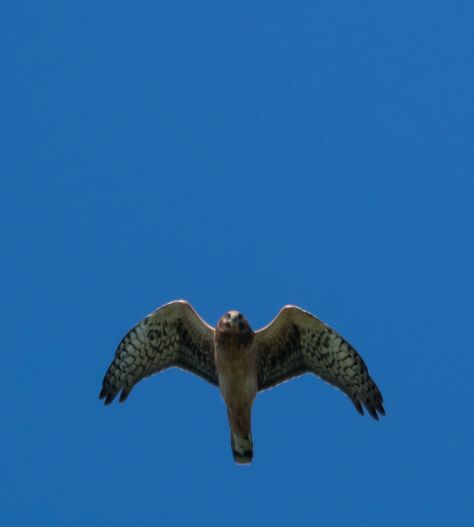 The real excitement came when a western subspecies (calurus) Red-tailed Hawk flew directly overhead. I’ll leave you with a few more photos from today, followed with a full list of birds counted. Thanks for reading! This entry was posted in Uncategorized on October 1, 2017 by Darrell Lawson. 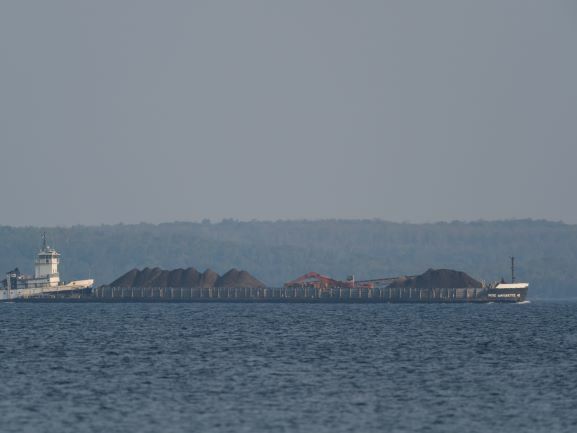 Freighter with piles of dirt. Anyway, other than the major shifts in wind, today was unseasonably warm. This may explain why many of the birds flying by today had their bills open. Birds often do this on warm days, so I assume it helps them thermoregulate. 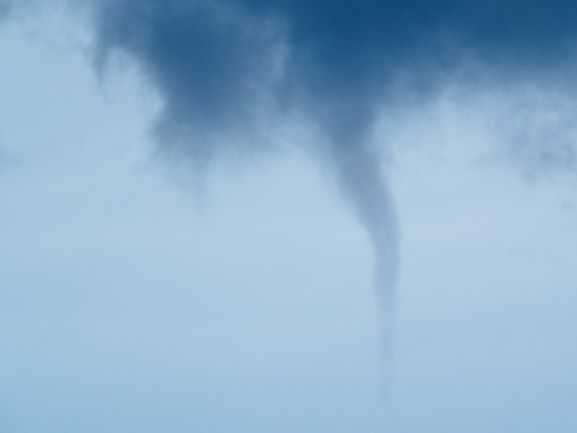 Despite the frequent changes in the direction of the wind, it primarily had a strong southern component to it all day long, which meant that it was overall a pretty slow day at the count. 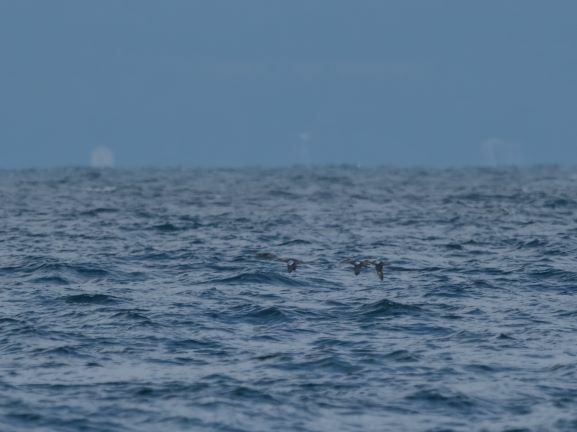 Loons, all Common, and raptors moved through in decent numbers prior to the first shift in the wind. The most exciting bird of the day came through early when a distant but unmistakable jaeger flew south along the bridge. Unfortunately, it was far too distant to determine species with any certainty. 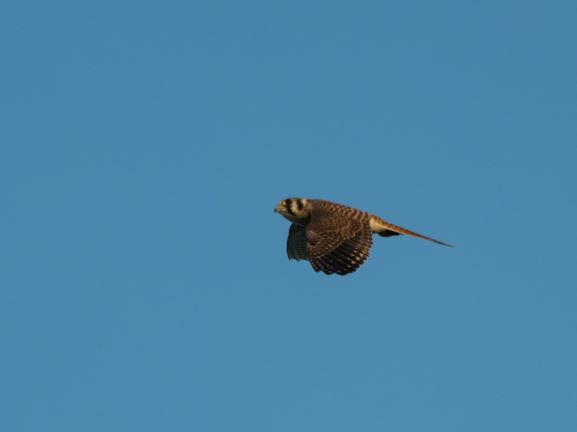 Three species of falcon migrated south today also, including Merlin, American Kestrel, and Peregrine Falcon. Unfortunately, once the wind changed, the flight shut down entirely. This happened about halfway through the day, so the last four hours were pretty dull. Here are a few photos from the first few hours followed by the daily totals. An American Kestrel that came through in the first hour. 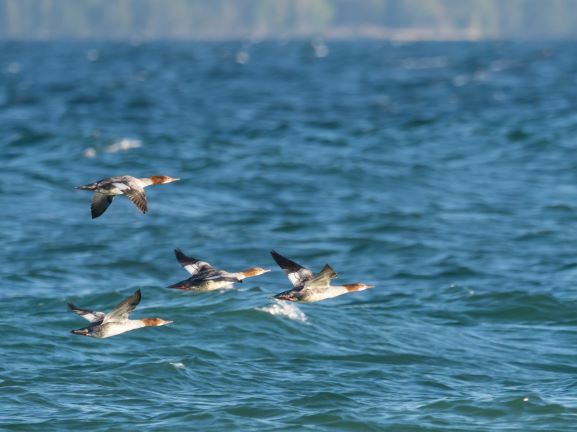 A small flock of Common Mergansers were floating offshore for bit today. 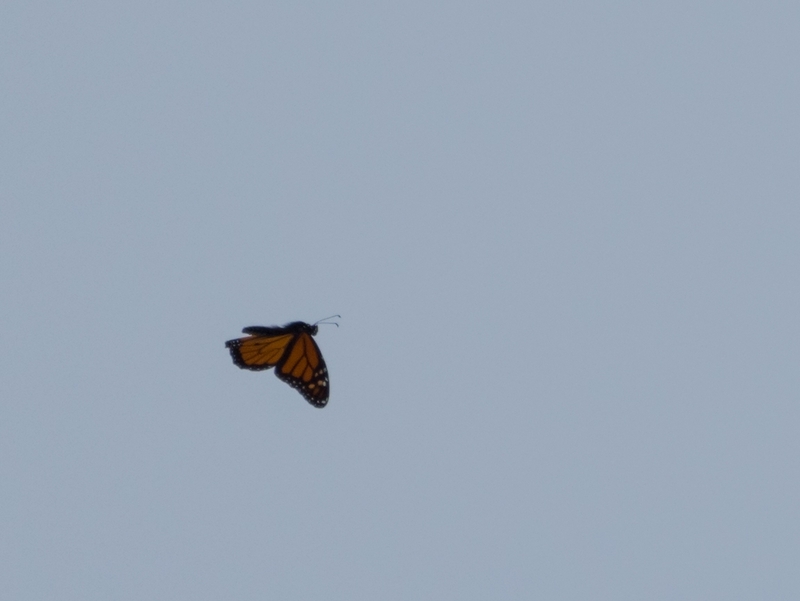 In the fall, we also keep track of Monarch Butterflies that we see flying south across the straits. 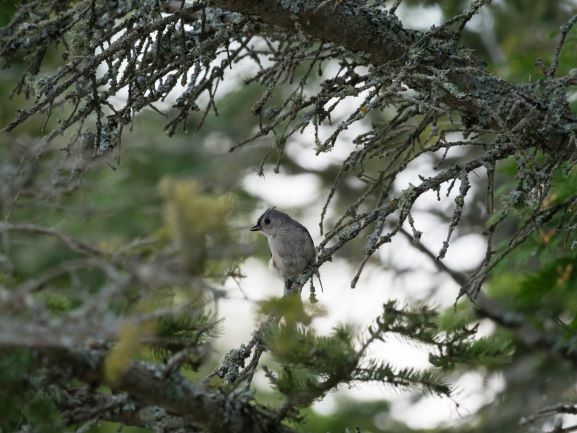 A Tufted Titmouse that came in looking for food. This entry was posted in Waterbirds on September 18, 2017 by Darrell Lawson. I filled in for Aspen on Sunday to give her a day off. Sorry this post is coming a day late. The morning was extremely windy and overcast, which meant it was very dark. How dark? Well, consider that the following photo actually was taken in color and you can see how little light there was to work with while identifying birds. You may notice the relatively large head with a pinched-in skinny neck, a silvery stripe running the length of the wing, and overall lack of contrast. That is enough to identify these ducks as Redheads, despite the lack of color. 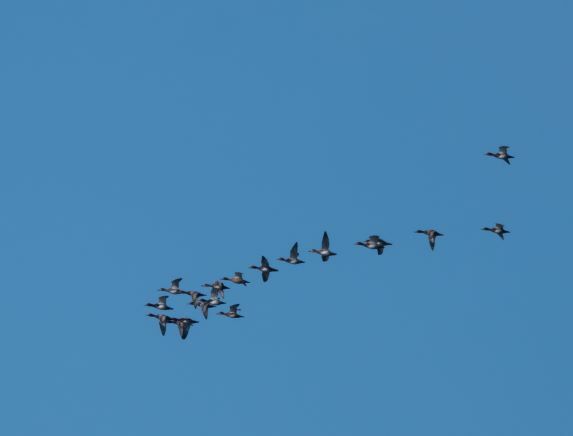 Despite the lack of light in the morning, there were quite a few birds on the move with the wing changing to the north-west. 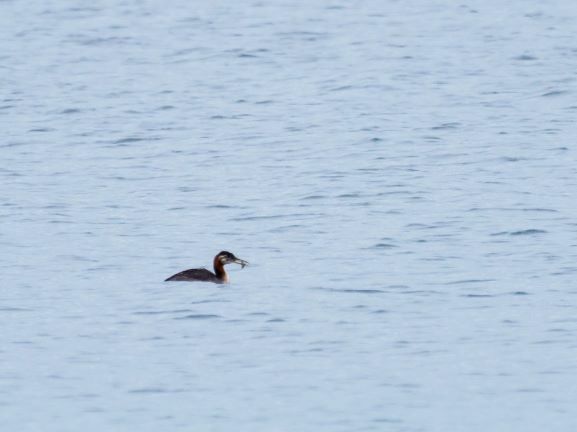 Red-necked Grebes were definitely the bird of the day. 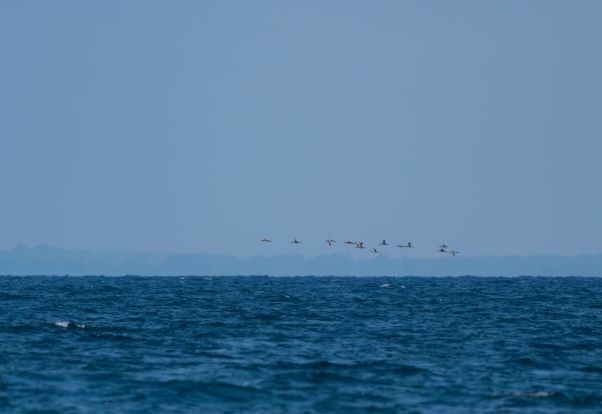 Here are a few shots of some of the flocks that were flying through the straits. 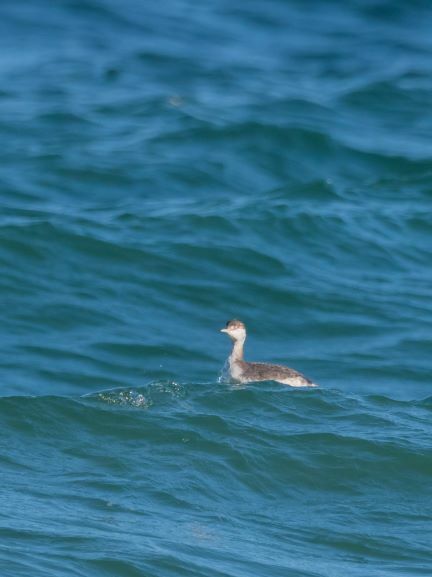 Many of the grebes that were flying around even stopped to sit on the water, although it was difficult to see them sitting in the waves. 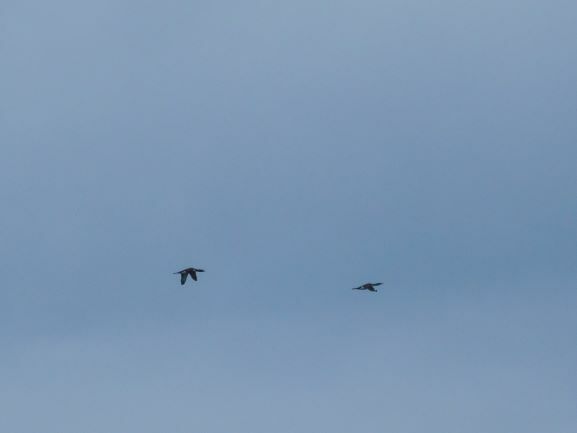 And here is a flock of four Blue-winged Teal that kept jumping from one flying grebe flock to another for about five minutes. Not sure what they were up to. 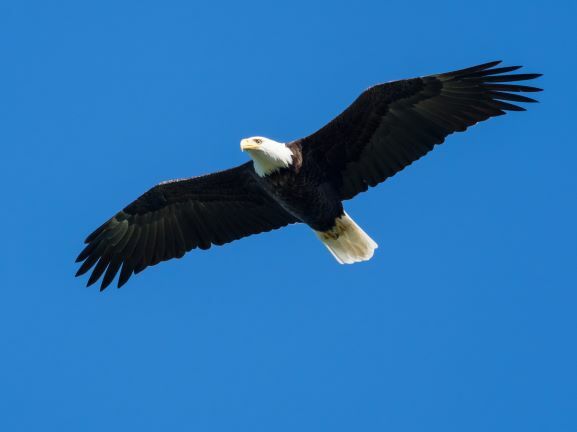 The other birds that seemed to be moving in numbers today were Bald Eagles. 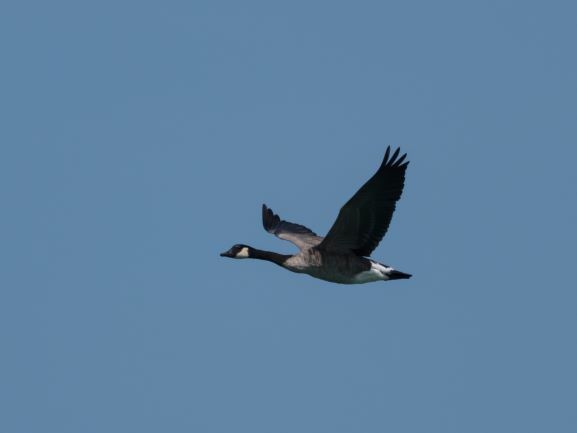 Here an adult and an almost-adult that passed over the straits on their way south. Just before the count ended, the only Canada Geese for the day flew along the lakeshore providing a little bit of entertainment in the slow afternoon (even though the weather had turned nice by then). 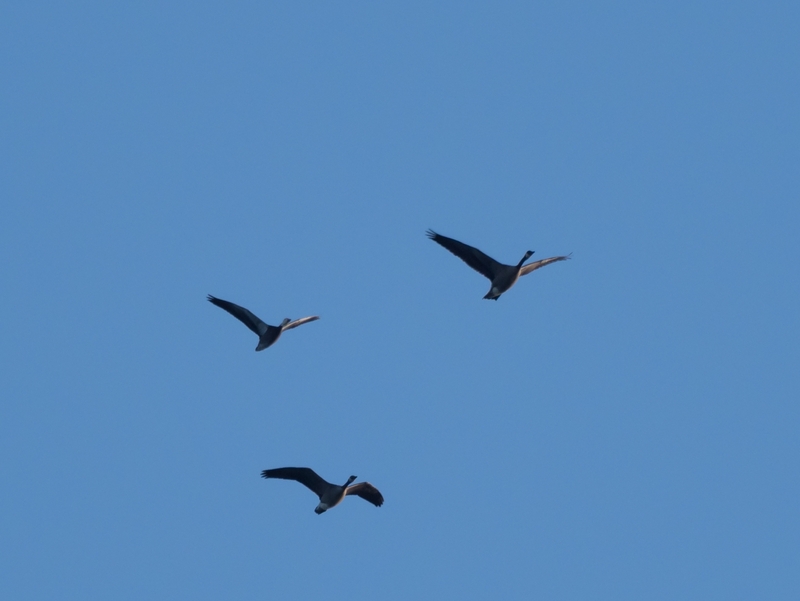 My photos show that the lead goose kept an eye on me the entire time they were flying by. Throughout the season so far, there have been a few Hooded Mergansers hanging around and making occasional fly-bys throughout the day. This day was no exception. Anyway, Aspen is back to counting now, but I’ll probably be filling in for her periodically throughout the season. I look forward to seeing what she will find. 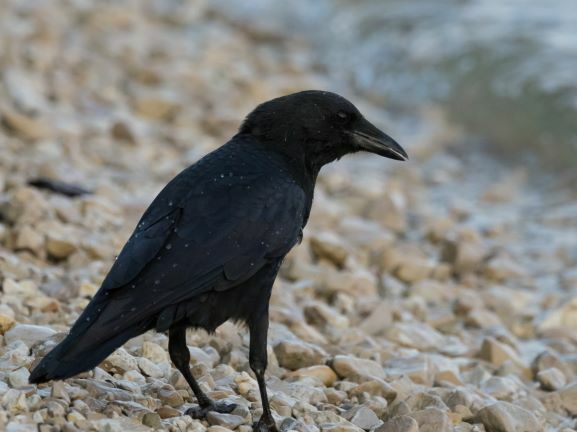 Here is a rundown of all the birds counted on Sunday. This entry was posted in Uncategorized on September 5, 2017 by Darrell Lawson. Strong north winds made for little waterbird movement and a long day for a waterbird counter. I filled in for Josh today so that he could have a much-deserved day off. There were very few highlights as there were very few birds. 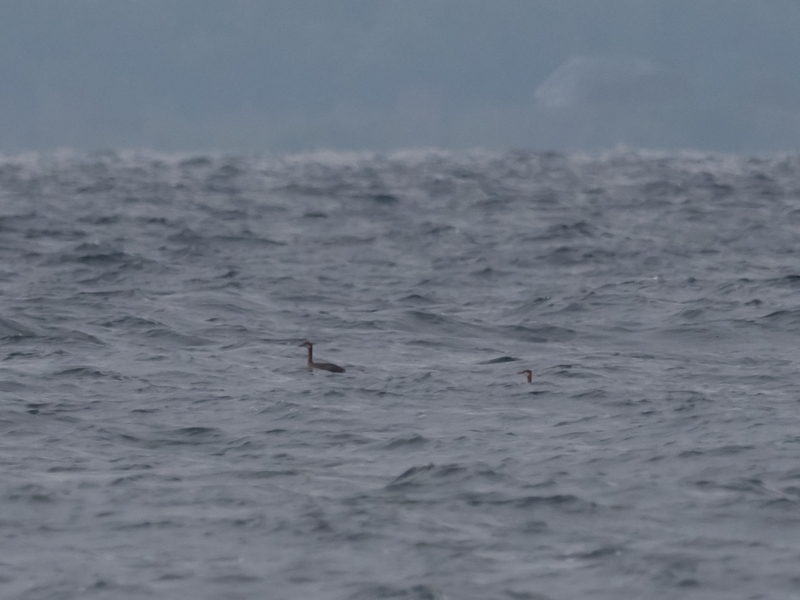 A Red-throated Loon flew over during the first hour. 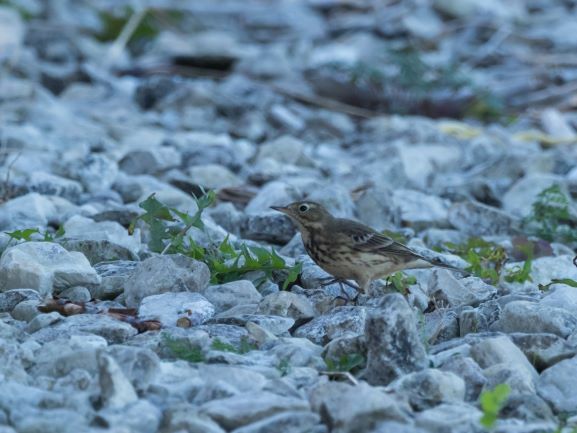 This is a much more expected species in the fall, but during the spring it is pretty much a rarity. 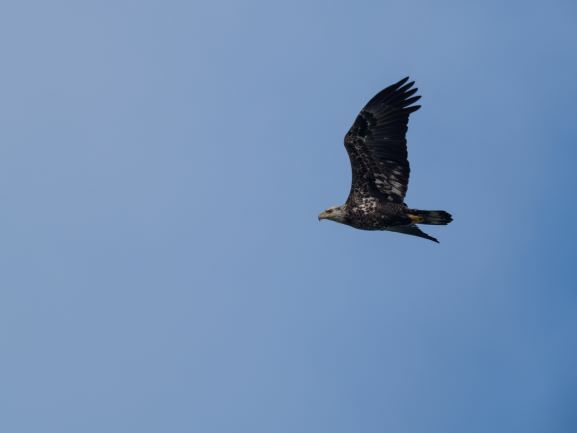 In the fifth hour, a Golden Eagle flew over the straits on its way to the Upper Peninsula. Other than that, there was a slow, but steady trickle of White-winged Scoters. There were quite a few Red-breasted Mergansers and some distant Long-tailed Ducks resting on the water, but they were typically only visible when they were frightened and lifted off to escape. A pair of Bald Eagles and a helicopter provided such a threat, real or perceived, which made it easier to count the mergansers. 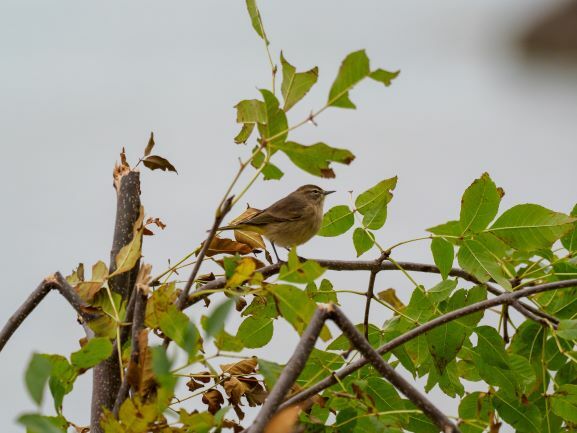 For a full list of birds, visit http://ebird.org/ebird/view/checklist/S36638734. This entry was posted in Uncategorized on May 8, 2017 by Darrell Lawson. Today was the Saturday of RaptorFest and unfortunately, Josh was feeling ill. I filled in for him at the waterbird count on what proved to be a rather slow day. The morning got off to a decent start in terms of diversity with both Red-breasted and Common Mergansers, Wood Ducks, Common Goldeneye, Long-tailed Ducks, and Common Loons. 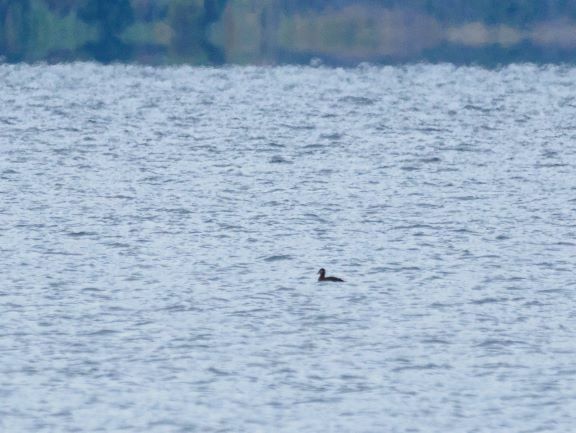 Today was the first real push of Common Loons for the season with fourteen counted. Many Red-breasted Mergansers were loafing off of shore, which provided decent viewing for our visitors. Unfortunately, the movement never really picked up. There was a steady trickle of waterbirds for the first few hours, but on two Canada Geese were counted for the entirety of the last two hours. 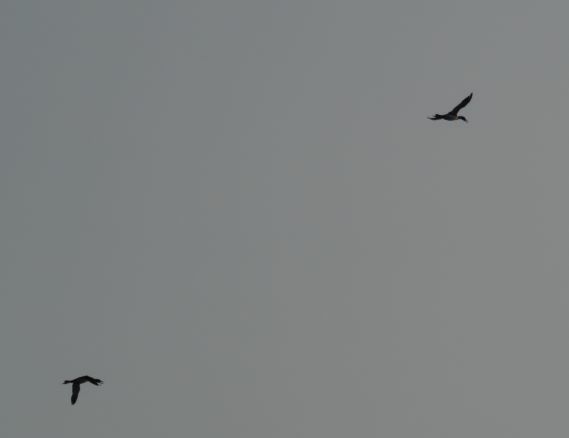 Other than the first multi-Loon day, the first Double-crested Cormorants of the season flew by as well. Raptor numbers were decent, but not high. 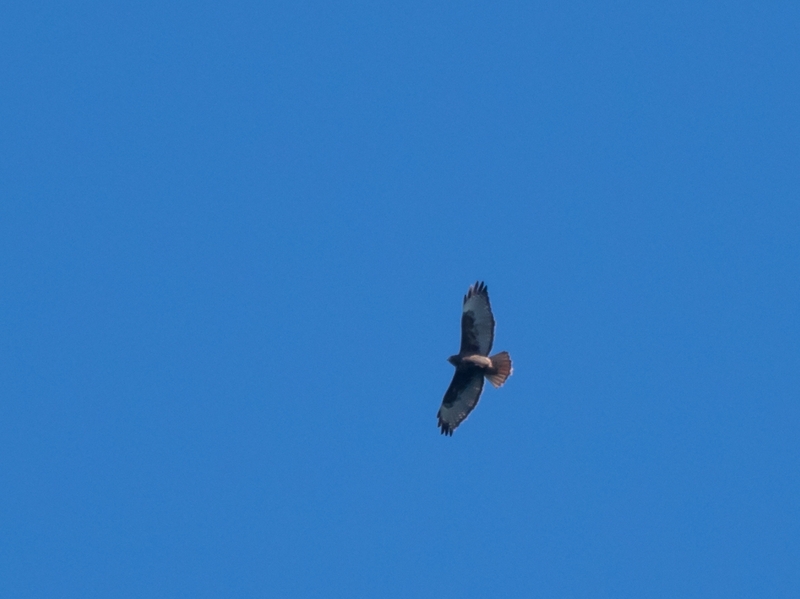 There was a good showing of Turkey Vultures and Red-tailed Hawks, and an unusually high four Red-shouldered Hawks, but little else. The best raptor moment came early when a Merlin flew in and landed on top of a spruce tree a very short distance off. Leonard Graf, who was kind enough to act as a waterbird interpreter for the day so I could focus on counting, was able to get it in his scope so visitors could get great views of this little falcon. The other highlight of the day came a short time later when a Pine Siskin landed in a tree right next to us so everyone was able to get really good looks at it as well. And here are a few photos from today. This entry was posted in Uncategorized on April 9, 2017 by Darrell Lawson. Here is a short video, taken by Kathy Germain, of a leucistic Red-tailed Hawk that visited the hawk watch last week. This entry was posted in Uncategorized on April 4, 2017 by Darrell Lawson.